When researching vintage designer stuff, it’s good to have some resources to compare labels and signatures to help you date and compare. An even better thing would be to share these resources. 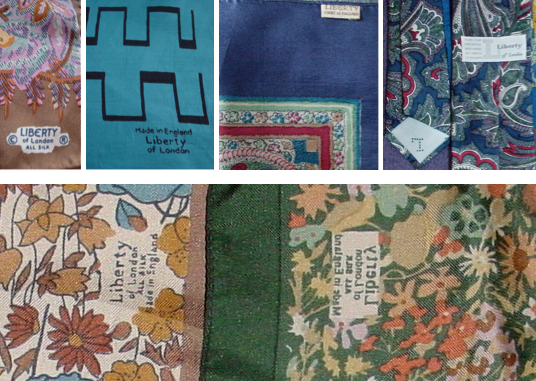 Since I’ve acquired a lot of Liberty of London scarves and garments made from Liberty fabrics over the years, I thought I’d make a little database of the different manufacturer’s marks that I’ve come across. Unfortunately, I don’t have specific dates for these signatures although I’m guessing they date from the 1970s to 1990s. And no, the backward logo is not an accident — I took a shot of the reverse to illustrate that a high quality Liberty print is just as clear from the back as it is from the front. While the photos above are mostly of scarves, Vintage Fashion Guild — one of the best resources for dating vintage clothing on the web — has a database of tags. As you can see, Liberty logos are all over the map. If anybody knows of any resources for dating Liberty scarves, please let us know in the comments. ← Happy 90th Birthday, Gucci! It is fantastic that someone (someone passionate about Liberty) has taken the time to add Liberty label information to a blog. I am a great collector of Liberty of London, scarves in particular. If you are ever tempted to sell please please contact me. hi there. 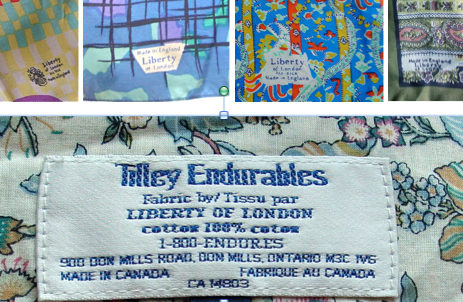 I have come across made in England liberty of London scarves and was wondering if you would be interested. I usually sell on ebay but I see you collect them.